I awoke fresh and excited for my first full day of volunteering in Laos. Today we were going to see the elephant nursery, where baby elephants can be born in safety, as well as the socialisation area where the elephants roam free. I was excited to see the greater extent of the project, and all that it could offer the elephants that call it home. Our day started with a delicious breakfast of freshly baked French bread, eggs and fruit. Fully set up for a hike into the jungle, we were off! We walked for about 30 minutes until we saw the elephants grazing around a small stream. It was amazing to see them in their natural habitat, completely undisturbed. They were gently guided down to the lake where they were to take their morning bathe. 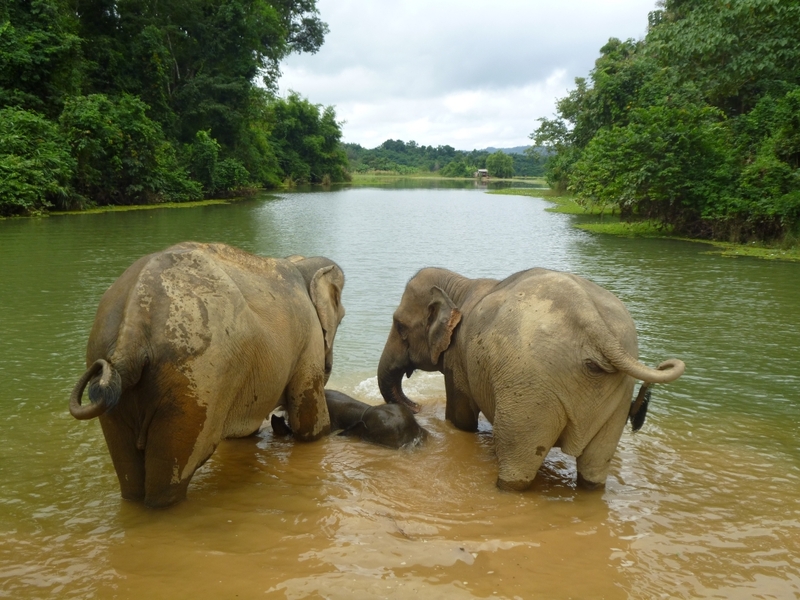 Bathing is incredibly important for elephants, as not only does it clean them and their skin, but it cools them down. Their skin is made up of so many wrinkles that the water gets stuck within these wrinkles, and will only dry by evaporation – hence keeping the elephant cool. After bathing, the elephants all came out and threw mud over themselves – this is the best way for them to get sun screen as the mud protects them from the sun. They all looked so happy with themselves. We were lucky enough to be able to spend time with the elephants again, feeling the strength of their muscles and the softness behind their ears. The elephants were then gently guided towards the socialisation area, an area extending over one hectare that has both jungle and grassland, the perfect elephant habitat. For several hours each day, the elephants are brought here to do what elephants do best – eat. Elephants can graze in the wild for up to 16 hours each day, usually consuming about 5% of their body weight in the process. This socialisation time is essential for the elephants, as many of them have never lived amongst other elephants before. They have never fended for themselves, as their mahouts in their previous life would always bring them food, take them to where they would graze and guide them to what they would be doing next. This is the opportunity for the elephants to push themselves and learn about life in the wild. They learn from each other what works and what doesn’t work, from where the good food is to what not to eat. It is incredible to sit in an elevated tree house and watch these elephants learning to be wild. It was a privillege, and something that I will remember forever. In addition to the socialisation area, there is also an enrichment area, designed to promote the natural behaviour of the elephants through human intervention. Volunteers help to create tasks and challenges for the elephants, aiming to encourage them to use their brains and work together. This can involve making things like pinatas (it is great to watch the elephants bash these with their trunks to get the food out), hiding food in tree branches and under logs, stashing food away in “games” so that they almost have to unwrap the food like a present. They have never had to learn in this way before, and challenging the elephants here will help them to develop in the socialisation area. Volunteers help to monitor their progress, and see how well each elephant is adapting and developing. 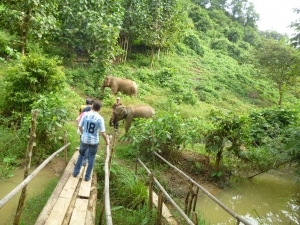 In addition to enjoying all tasks surrounding the elephants, which involves lots of observation work, data collection, basic maintenance and outdoor work, this project is a fantastic place to be volunteering in Laos. When the work was done, we would jump in a kayak and explore the lake as the sun went elegantly down behind the mountains. We would relax together in the on-site bar, eating home-made delicious Lao snacks and trying their local drinks. We were all bursting from our experiences each day, and would go to bed tired, but very happy. 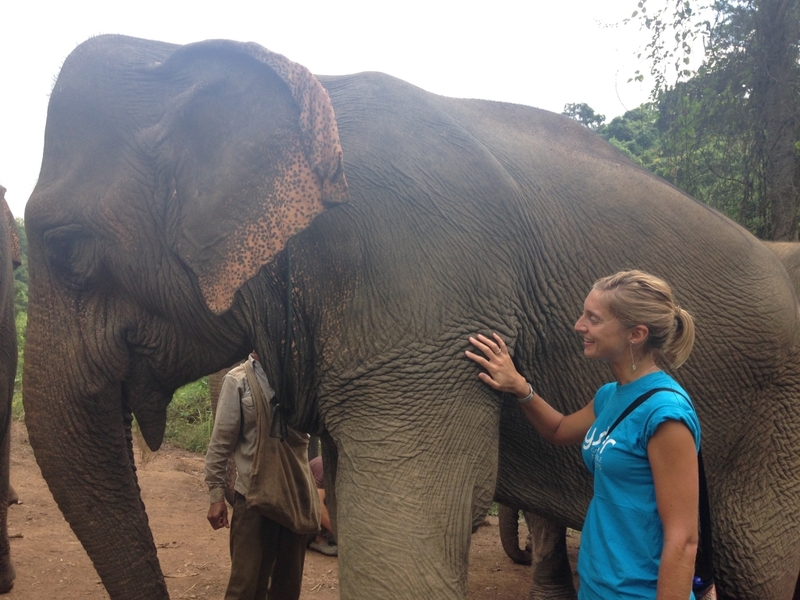 To find out more about volunteering in Laos, see our elephant conservation web page.